Cui bono? : With the midterm elections days away, and with signs of the much-trumpeted “blue wave” rapidly receding, only Democrats — not Republicans or President Trump — could benefit from these package bombs. Why would any Trump supporter be so stupid as to send them? The packages do not have the U.S. Postal Service’s postmarks, stamp cancellation lines, and barcodes, as pointed out by blogger Boris Badenov of 12160 Social Network. As pointed out by blogger Boris Badenov of 12160 Social Network, the packages do not have the U.S. 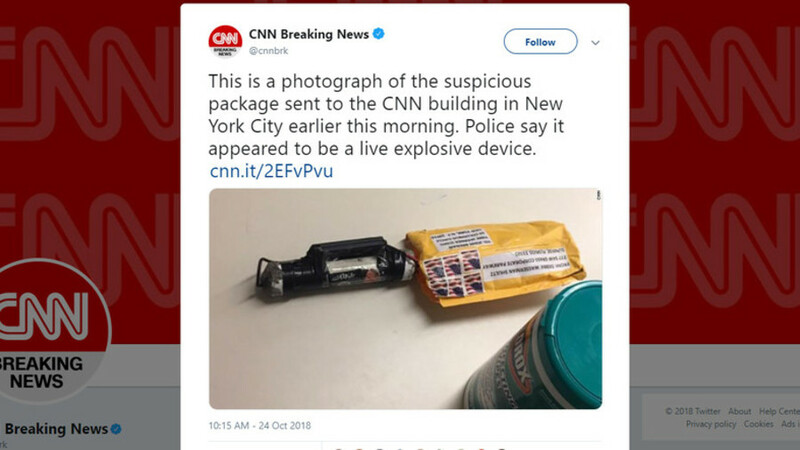 Postal Service’s postmarks, stamp cancellation lines, and barcodes, although at least the package addressed to Brennan had been processed by USPS and delivered to CNN’s Manhattan office. Culling and Postmarking: Postal workers send the letter through a machine that rapidly separates mail by shape, separating letters from large envelopes and packages (the cullingoperation). The machine orients letters so that all addresses face the same way and are right side up. It then applies a postmark with the date and place where the letter was sorted and cancellation lines so the stamp cannot be reused, in order to protect postal revenue. Scanning and Lifting Images: Every letter gets identified by a code consisting of a series of florescent bars imprinted on the back. The address on the front of each letter is scanned by an optical character reader. Images of letters that could not be successfullyread are transmitted to a remote encoding center for further processing. All letters are placed in trays and moved to the next piece of automated equipment for barcode application. Applying a Barcode and Sorting: Linked with the identification code, a barcode is sprayed on the front of the letter. Representing the specific delivery address, the barcode consists of tall and short bars used for all further sorting. The barcode sends a letter into abin on the machine for a particular range of ZIP Codes; these identify the next processing plant. Sorting into Delivery Order: At the plant, the letters in the tray are fed through a barcode sorter, which separates letters for a specific ZIP Code from other letters in that ZIP Coderange. After this, the letter will receive its final sortation. A delivery barcode sorter sorts the letter to the particular carrier who will deliver it. The delivery barcode sorter also arranges that carrier’s letters into the order of delivery. Delivery to Addressee: The carrier drives to the street where the letter is to be delivered, safely parks, then loads his or her satchel with the mail to be carried to each house orbusiness. Within minutes of leaving the truck, the carrier delivers the letter to the addressee. The media will not search for the patsy’s handlers. The media will not demand to speak to him in jail in the first few hours or even the first few days after his arrest. His ‘defense’ attorney will be either incompetent or a Deep State shill. His guilt and subsequent conviction will be predetermined.